I’m feeling a little guilty about broadcasting my daughter’s vehicular mishap all over the Internet. She’s a great kid. So I am going to post something nice about her. 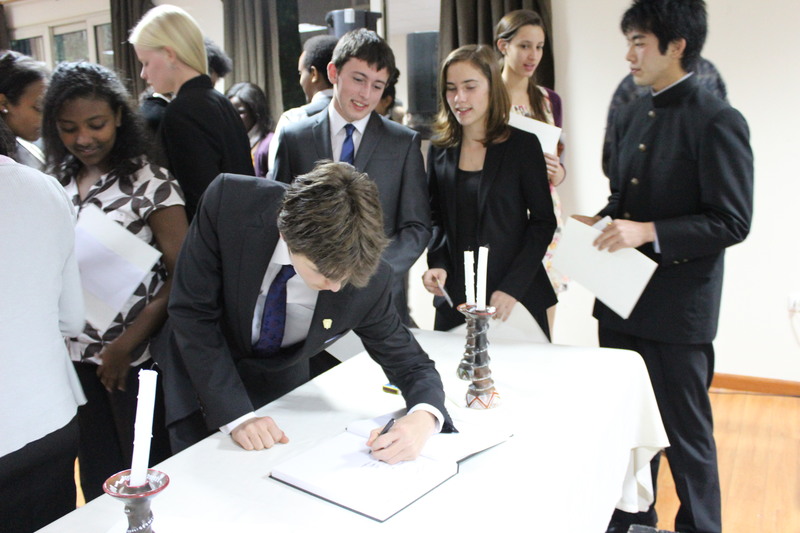 A couple of weeks ago, our school held an induction ceremony for new members of the ICS Honor Society. Alekka was one of three new members this term. That’s her in the black suit, watching a friend sign the register. It’s not easy to get in. To be eligible for nomination, students have to be on both academic and effort honor rolls for three consecutive terms, and they have to actively participate in community service and leadership. Then they have to pass the character test (teachers have the opportunity to blackball any nominee who doesn’t measure up). The Honor Society is a community service organization. They put on a fundraising events for charity, assist at school functions, and help orient new students. Needless to say, Alekka’s dad and I are very proud. More about the ceremony on the ICS website here. This entry was posted in Addis Ababa, International Community School and tagged Alekka, community service, Honor Society. Bookmark the permalink.